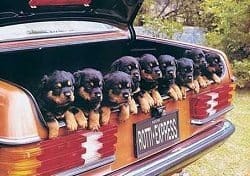 Are you wondering how you are going to manage an upcoming car trip with your Rottweiler? Perhaps it’s the first time your dog has come on holiday, or maybe you are moving home and your Rotty has to do his longest trip ever? Preparation is very important if you’re planning on having a pleasant road trip. This may take a bit of effort on your part, but it will be worth it. Read on and learn about travelling with your dog. Safety is very important when driving with your dog. It is actually illegal in certain places to have a dog roaming around in a vehicle as you drive. Your dog should be secure in the car to ensure safe travel for him and everyone else on the road. This is the safest way to transport your dog. You will need to get a crate that is large enough for your dog to stand up, turn around, and lay down in. This way they can be comfortable and not feel trapped or squeezed in. Make sure the crate is free of things that could hurt your dog during travel. It is also important that you made sure they have a blanket or cushion to lay on. Keep the mood very positive when crating your dog. Make sure to take your Rottweiler for a spin around town before taking a long journey. This way you’ll get an idea of his travelling capability and also help him to relax in the car. Watch out for signs of stress and anxiety as you approach the car with your dog, keep an eye out for car sickness too. There is also the option of getting your dog a seat belt. These can be purchased at your local pet store and are easily installed in the back seat of your car. It is a big safety hazard to let your dog ride in the front with you. If there were an accident, your dog could be seriously injured or killed. They should always be in the back seat. Keep your back window cracked so they get some fresh air. It is not safe to allow them to hang from the window. They run the risk of eye injury from flying debris, and also your dog may surprise you and try to jump out the window if you are not careful. Just like if you were crating your dog, it is important that you take them for a ride to get them used to the seat belt before heading out for a long road trip. It is also vital that you choose the safest seat belt harness that you can find, you can even use it for walks a few times to ensure that it is comfortable. The canine car barrier is another great option. This is a barrier that simply goes in the back of your car to prevent your dog from jumping over the seats. This works for just about every vehicle. It’s great if you have an SUV. 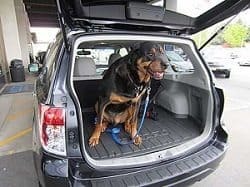 You can place the barrier so your dog is in the back of the vehicle and your family can relax in the seats without the dog jumping in their laps. It is important to be safe when driving with your dog. Take extra care when turning and try not to make sudden stops, for this could hurt your dog if they get knocked around. Try not to feed your dog before the trip. It’s best to fast your dog so they are less likely to have an accident or get car sick. Travel sickness for dogs is doubly distressing because they have no idea what is going on. Make sure to stop frequently for bathroom and play breaks. Your dog will get jarred around quite a bit in the car, and may even be nervous, so they will more than likely have to go to the bathroom more frequently than normal. Breaking up the trip regularly is a good idea. This gives all of you time to stretch your legs and relax. Make sure to walk your dog, and even toss their ball around for them for a minute to get out some of that bottled up energy they may have. You should bring your Rottweilers favorite blanket, toy, and bone along with you for the trip. This will help your dog remain calm and will keep them busy. Keeping your dog hydrated for the trip is important as well. You will want to have a spill proof bowl so your dog can quench their thirst without making a big mess. There is always the possibility of some spilled water, but you can prevent huge messes by only giving your dog small amounts at a time and refilling the bowl more frequently. 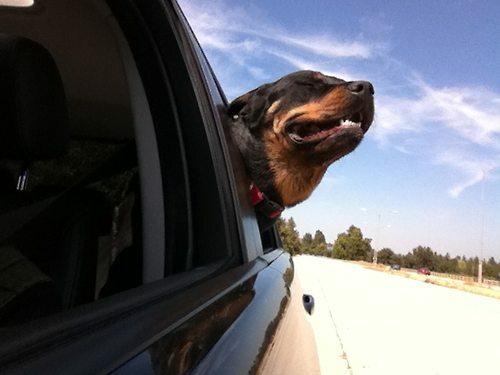 A hot car can easily become an oven, in fact a Rottweiler could die in a hot car, even with the windows open, in less that 15 minutes. Please don’t take the risk by leaving him alone, even whilst you grab a quick coffee. If you are traveling with your family, keep your children occupied and do not allow them to tease or poke at the dog during the trip. The experience can be traumatizing enough for them, it’s certainly not going to help if your kids get bored and start bugging the dog as this will make him stressed. Keep the mood calm. Avoid blasting loud music, for this could cause your dog anxiety. Keep the music low and the yelling and screaming to a minimum. We all get excited on road trips, and your kids are going to be over zealous. Tire out your Rottweiler and your kids before the trip. Take them for a nice long walk, or even a run. Really take the wind out of their sails. This way all parties of the trip may end up snoozing for a chunk of it. I do not recommend you leave your Rottweiler in the car unattended if it is hot outside for any reason what­so­ever. If you are hungry, I suggest going somewhere with a drive­-through. If the weather is cooler and you must leave your dog alone, do not leave them for more than a few minutes if possible. And always leave the windows cracked for them. Don’t forget to give your dog water during the trip. It is so easy to get dehydrated, especially if it is hot or if your dog is nervous or anxious. 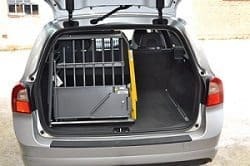 Always have your dog crated, seat belted, or behind a barrier while traveling. Take it easy on the road. Don’t speed, avoid slamming on the breaks, and don’t whip around corners.